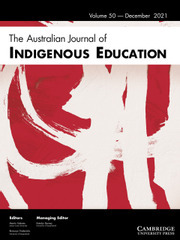 Published in association with Aboriginal and Torres Strait Islander Studies Unit, The University of Queensland, the Australian Journal of Indigenous Education is an internationally refereed journal which publishes papers and reports on the theory, method, and practice of Indigenous education. The journal welcomes articles that ground theoretical reflections and discussions in qualitative and quantitative studies, as well as examples of best practice with a focus on Indigenous education. While AJIE has a particular focus on Indigenous education in Australia and Oceania, research which explores educational contexts and experiences around the globe are welcome. AJIE seeks to foster debate between researchers, government, and community groups on the shifting paradigms, problems, and practical outcomes of Indigenous education.